The essence of barbecue might come from the rub, marinade, and smoke, but its personality comes from the sauce. 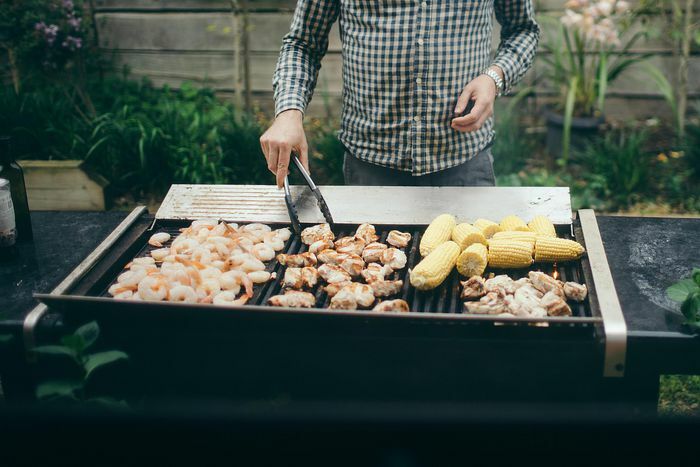 Barbecue sauces can vary widely depending on the region and the protein. The most popular sauces—the ones you'll find in the supermarket—are made with a tomato base. Some are sweet, and some are savory, smoky, or spicy. But not all sauces start with a tomato base. Eastern North Carolina is a good example. Its signature thin barbecue sauce is mostly a combination of vinegar and red pepper flakes. South Carolinians favor a yellow mustard based sauce which includes vinegar, honey or brown sugar, and hot sauce. The Alabama white barbecue sauce is the true nonconformist. The sauce is a mixture of mayonnaise, some black pepper, cayenne, and vinegar. 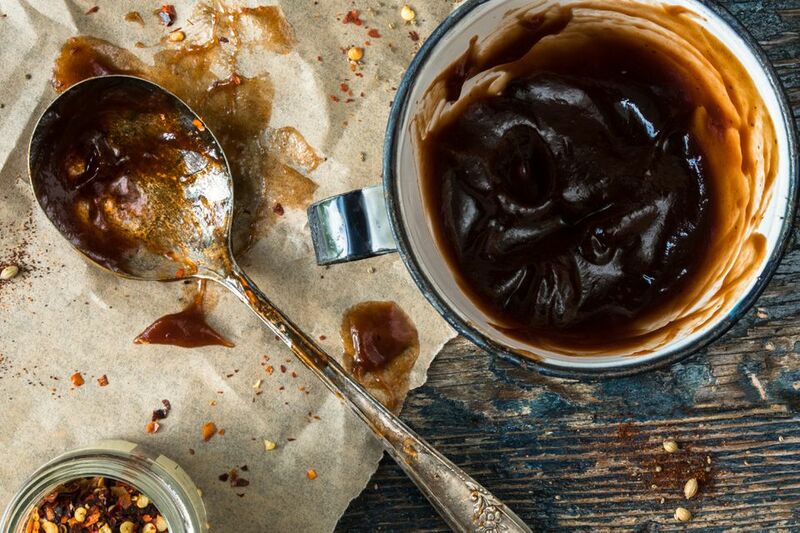 The one thing a great barbecue sauce must have is a balance. To begin, choose the base and then add the sweet and sour elements. When it comes to barbecue sauce, there is no one perfect ratio. Do you like a super tangy sauce, a hot and spicy sauce, or a sweet sauce? Once you have the balance that suits your taste and the food you plan to cook, you can begin to add seasonings and aromatics, like salt, herbs, spices, onions, garlic, and heat. Unless you're making a Carolina vinegar sauce or mustard sauce, or the Alabama mayonnaise-based sauce, your base will likely be tomato sauce in some form. Popular choices include ketchup, chili sauce (not the Asian kind), tomato sauce, and pureed tomatoes. For sweeteners, plain granulated sugar, brown sugar—light or dark—and molasses are good choices. Or you might choose something different, like honey, agave nectar, cane syrup, corn syrup, maple syrup, jelly, jam, preserves, or concentrated fruit juice. Now, for the tangy sour element, add just about any kind of vinegar or citrus juice. Or add sour notes with some pickle juice or mustard. Tamarind paste, with its tart and slightly sweet flavor, is another option. Once you have combined the basic sauce ingredients, it's time to think about seasonings. Kosher salt is a simple way to add saltiness, or you might choose a salty ingredient like soy sauce or tamari, anchovy paste, or ripe olives. Worcestershire sauce will add saltiness as well as some sweetness. For extra texture and depth, you might add aromatics. Finely chopped onions, bell pepper, and minced garlic are all good choices. Some herbs that work well in barbecue sauce are basil, bay leaf, cilantro, mint, parsley, rosemary, sage, and thyme. The spices you choose will depend on the sweetness of the sauce and your chosen protein. Allspice, cardamom, cinnamon, ginger, and nutmeg are good choices for a sweet sauce, while coriander, cumin, paprika, sage, mustard (seeds or dry powder), celery seeds, and curry powder are well-suited for a more savory sauce. Even if you don't have a pit or smoker, there are ways to add that smoked flavor. Liquid smoke comes in a variety of flavors, from applewood and mesquite to hickory and oak. There are also many smoke-flavored barbecue seasoning blends and spices on the market. Optionally, for a rich finish and smooth texture, add a little butter, vegetable oil, lard, or bacon drippings. If you put all of your favorite elements together but the sauce is too spicy, there are some things you can do. One obvious way to dilute the spiciness is to scale up all of the other ingredients. More of the base, sweet, and sour ingredients can help neutralize or weaken the heat. Or, try adding more sweetener with extra acid, but add it in very small amounts and taste as you go. A small amount of brown sugar or honey can tone down a spicy sauce when combined with a bit of vinegar or lemon or lime juice. If your salt is too sweet, your first impulse might be to add salt, but that can actually accentuate the sweetness. Try adding more vinegar or lemon juice to the sauce. Or dilute it with extra base and sour elements. If you use many naturally salty ingredients or reduce the sauce too much, you might find it is too salty. Lemon juice or brown sugar can help tone it down, but the best solution for a very salty sauce is to double the batch, leaving out any salty ingredients. Besides the obvious ribs, pulled pork, and smoked brisket, barbecue sauce can also be used to add flavor and zest to many other dishes. Add barbecue sauce to your baked beans along with some shredded pulled pork or brisket. Use the sauce as a dip for fried chicken strips. Use it instead of ketchup on sandwiches and burgers. Use it as the base sauce on a barbecue pizza. Make a tasty Brunswick stew with barbecue sauce. Spread barbecue sauce over a baked meatloaf.